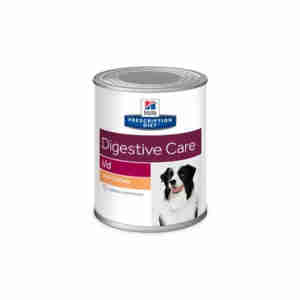 Hill’s Prescription Diet Canine I/D is a highly digestible formula designed for dogs with gastrointestinal disorders. Prescription Diet Canine I/D is easy to digest thanks to its blend of soluble and insoluble fibre – essential for promoting healthy digestion and improving stool quality. Gastrointestinal disorders can cause your dog stomach pain, diarrhoea or constipation. Untreated, this can lead to serious health problems such as an electrolyte imbalance and malnutrition. Hill’s formula encourages maximum absorption of nutrients to get your pet back to their normal selves in as little as three days. Efficient digestion means your pet is able to absorb vitamins that they need to repair tissue and obtain energy. This food has a special combination of electrolytes, B vitamins and antioxidants that are clinically proven to repair and support your dog's immune system, which could be compromised by poor digestion of nutrients. Under your vet’s recommendation, this food should replace your dog’s regular food for the period of their illness. proven to settle upset stomachs in just three days. There are lots of different types of gastrointestinal disorders caused by various factors. You can spot the most common symptoms easily – if your dog is shows signs of diarrhoea, vomiting, constipation or weight loss, it could be an indication of one of these disorders. If you spot any of these symptoms you should consult your vet immediately, who can give you a thorough diagnosis. Prescription Diet Canine I/D should only be used under the recommendation and guidance of your pet’s vet after an examination and diagnosis. Ask your vet about the recommended feeding dose to suit your dog, then gradually introduce their new food over a seven-day period. If your pet is showing a lack of appetite or signs of discomfort whilst eating, split their recommended daily amount into smaller portions throughout the day. Because veterinary diets are formulated for the nutritional support of pets with specific clinical conditions, we recommend that you only use them under professional advice. For more information on feeding Hill’s Prescription Diet Canine I/D to your dog, please consult your veterinary surgeon. Prescription Diet™ Canine i/d™ Dry - Ground maize, ground rice, dried whole egg, chicken and turkey meal, maize gluten meal, digest, animal fat, dried beet pulp, vegetable oil, calcium carbonate, flaxseed, salt, potassium chloride, dicalcium phosphate, taurine, L-tryptophan, vitamins and trace elements. Contains EU approved antioxidant. 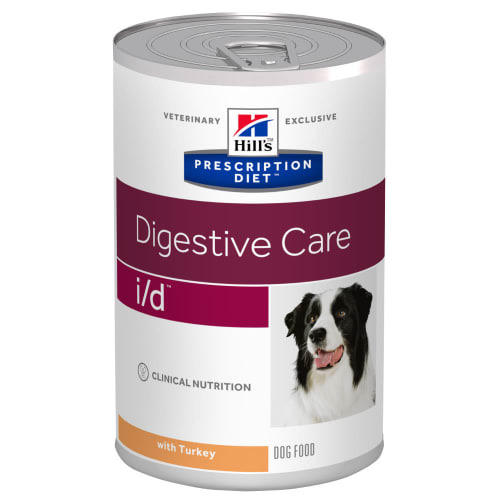 Prescription Diet™ Canine i/d™ Cans- Turkey, ground rice, ground maize, dried whole egg, liver, Fibrim® 1260 (soluble fibre source), potassium chloride, dicalcium phosphate, iodised salt, choline chloride, zinc oxide, ferrous sulphate, copper sulphate, manganous oxide, sodium selenite, calcium iodate, D-activated animal sterol (source of vitamin D3), vitamin E supplement, thiamin, niacin, calcium pantothenate, pyridoxine hydrochloride, riboflavin, folic acid, biotin, vitamin B12 supplement. Prescription Diet™ Canine i/d™ RECOVERY PACK - Turkey, ground rice, pork liver, ground maize, dried whole egg, soy fibre, iron oxide, dicalcium phosphate, potassium chloride, digest, caramel, iodised salt, taurine, vitamins and trace elements. Recommended by my vet for my Cavalier who eats anything! This often results in Colitis. Since feeding this, no colitis. The price is considerably lower than when purchased through my Vet Practice too. Very pleased with Pet Supermarket, From order to delivery only takes a few days and their prices are quite competitive so what's not to like! On the Hill's i/d itself, It actually does what it says it will do. My 14 year old Old English Sheepdog has some tummy/bowel issues that completely disappear when she eats the i/d. Although she really seems to like the food I find it hard to get her to eat the recommended quantity but the amount she eats is enough to do the job. Beth has a very sensitive stomach and this food suits her down to the ground. Thanks to MedicAnimal for such a good service at a very competitive price.